General Zod is always looking for more people to serve him. So what can you do? We have created the following images for you to email to people or to print out. You can make flyers from them. You can make stickers from them. 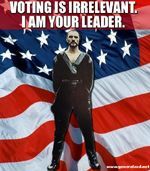 Zod wants you to stick these pictures all over the place! Put them on cars, buildings, people... it doesn't matter. and we will put it up on this site immediately. Zod will then spare your puny life. SPREAD THE WORD ABOUT ZOD WITH HIS NEW STICKERS! Do you have something to contribute to Zod? Please don't hesitate to send it to us!